Europe's airline industry is in the spotlight Wednesday, with stocks taking a nosedive on poor earnings and a big order cancellation. Futures in general were slumping after the World Bank dragged down its forecast for global growth. 1. Airline stocks hit by turbulence: Shares in Lufthansa Group (DLAKY) were down by roughly 10% in Germany after the airline operator issued a surprise profit warning. Airbus (EADSY) stock fell by about 4% in Paris after Emirates Airline canceled a multi-billion dollar order for 70 A350 planes. Shares in Rolls-Royce (RYCEF), which makes the engines for the A350s, also took a hit in London trading. 2. Fashion forward -- Inditex, Target: Shares in the Spanish fashion company behind the popular Zara brand were getting a lift in Europe. Inditex (IDEXY) reported better-than-expected results for the first quarter. Target (TGT) stock could be on the move as the company hosts a shareholder meeting in Dallas in the afternoon. The company has been suffering over the last few months -- it was hit by a major data breach in December, fired its CEO, and profits at the retailer have been lackluster. 3. Premarket movements: U.S. stock futures were looking soft ahead of the opening bell. U.S. stocks barely budged over the previous trading session. The Dow Jones Industrial Average made slight gains Tuesday and marked its fourth consecutive record close (at 16,945.92).The Nasdaq also finished with a narrow gain, but the S&P 500 saw its five-day winning streak come to an end, finishing flat. "It seems that the trend has been for lower opens and then for the market to make up for it later in the day, resulting in record highs," said Peter Cardillo, chief market economist at Rockwell Global Capital. "I suspect we're going to see another repeat of yesterday's market action." 4. 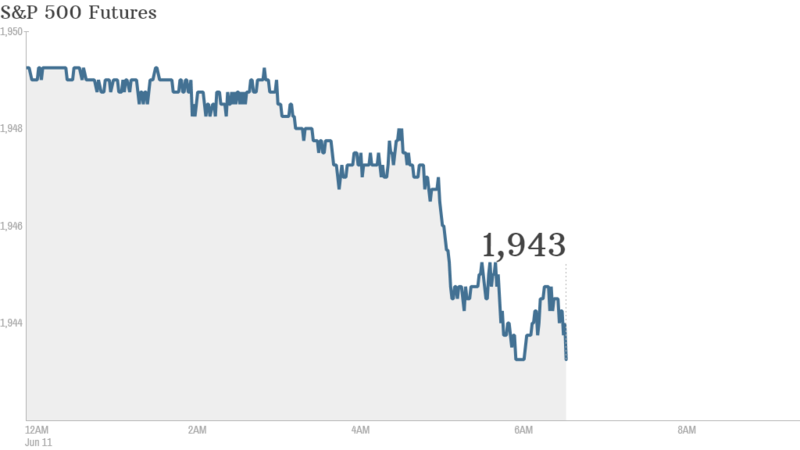 Economic update: At 8:30 a.m. ET, a report on U.S. state GDP growth will come out, revealing the health of the 50 states. The Treasury Department will release its monthly budget statement at 2 p.m.
5. International stock market action: European markets were dropping in midday trading.